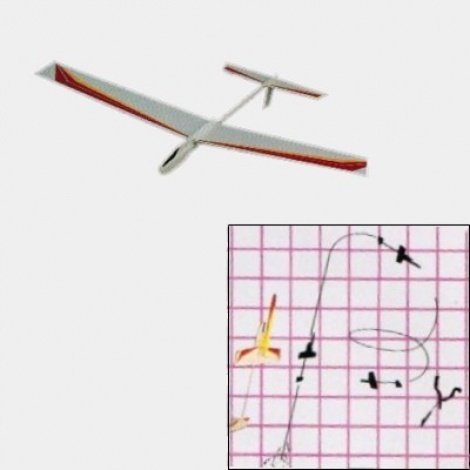 This out of production classic rocket-powered glider kit from rocketry pioneers Model Rectifier Corporation, is part of the innovative classic Concept II range of MRC model rocket kits. This kit stands nearly 43 cms tall and features a glider with a 40cms wingspan. Kit also features precision molded parts for easy assembly including a one piece molded fuselage with positioning slots for wing and stabilizer attachment and a molded pod attachment that perfectly matches the molded fuselage. When the motor's ejection charge fires, the pod releases, is recovered by streamer, while the glider glides back to earth. The high performance design of this kit allows flights of up to three minutes. You don't see many of these for sale so secure your model order now. NOTE remaining kits have external packaging damage however there is no damage to the kit components themselves.